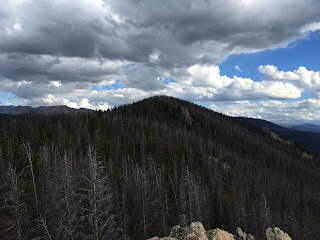 Hiking Rocky Mountain National Park: The Southwest Corner of RMNP Part 2. I fondly look back to my visit to this area last year. Two days of peace and quiet, lots of peaks visited, moose seen, and right in the middle of the prime season of color in the fall. It was fun, beautiful, and awe inspiring. Unfortunately, it wasn't that long after I got home that I looked at LoJ and saw Twin Peaks West pop up! Argh! I'd even taken photos of this, but didn't know it was named and I swear it wasn't on LoJ at the time. Thus, I needed to make a return trip to the Roaring Fork trail head, and hike for several hours, solely to visit this unranked peak I was so close to last year. I had some company this time, as I suggested this visit to my friend Gary. We met in Lyons at 4:30, and started the drive over. We started from the trail head shortly after 7, and headed up the initially steep climb. We somehow went right by the intersection and sign for the split with the Stone Lake trail, and soon were approaching Watanga Lake. 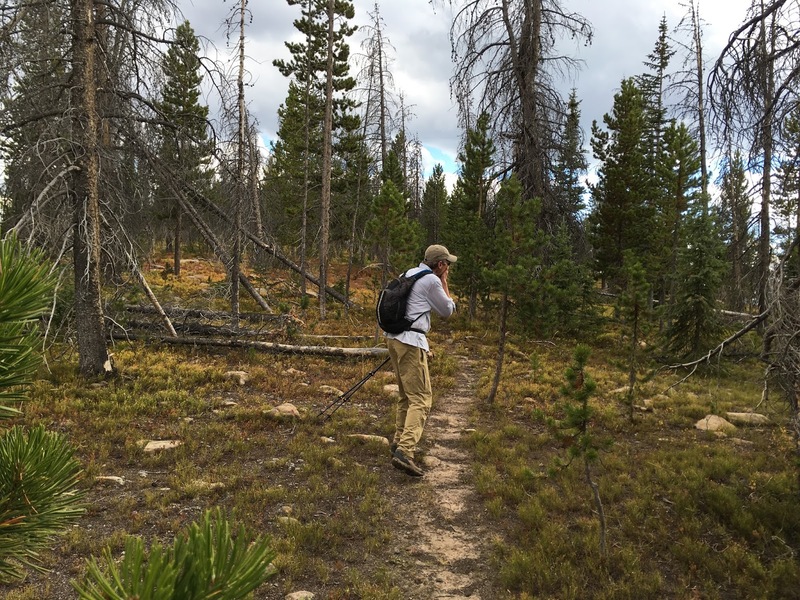 We got to a small clearing, and looked at a steeper but more direct route to head almost directly up to Twin Peaks. This looked like it would be fine from the topo, but we did encounter some challenging rocky terrain along the way. Gary navigates some rocky terrain after the initial climb. We got to this point and looked at a few different ways to go. Directly ahead of us, a gully that looked pretty ok was blocked by a chock stone at the bottom. We tried, but could not find a way around this. 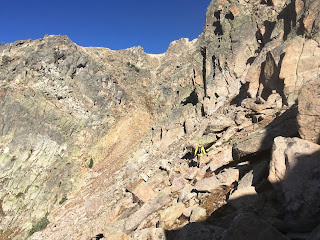 We looked left, and started up a grass and rock gully that got steeper and looser as we got near the top. The last 15 feet or so ascended some pretty loose and crummy rock and sand. Looking back down to the forest. We popped out on the broad summit plateau, glad to be on easier terrain (or at least I was!). From here, it was just a few minutes and a short jaunt over to the summit of Twin Peaks, 11957 feet. The summit of Twin Peaks. Last year I didn't find a register here, but we found it this time. All the way over there! Now you know why I was so annoyed! I was literally minutes away from it last year, and it took us six whole minutes to make the trip over to it this time. I would rather have spent those six minutes last year, as it had now taken us a little over three hours to get to this point! Back to Twin Peaks East. There was a small prescription drug register on this summit with a single piece of paper inside. If only I'd looked last year! 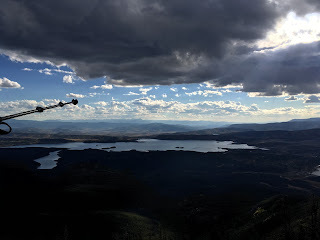 Looking down to Lake Granby. We decided to head north to take the standard descent route down. Last year I attempted this route, but I saw a bear run into the gully I wanted to go down, so I took the one more to the north. What a difference the southern gully made- an easy to follow animal trail the whole way down, nothing more than second class (if that even), and no rock to move over at all! It was pretty easy, way better than the route I took last year. It took us about twenty minutes to get into the area of Watanga Lake, though we hit the trail below the lake, and never saw it. While the route we took up was fun and adventurous, this method would have definitely been easier, and likely been quicker. We cruised down the trail, enjoying the sights and some conversation. We arrived back at the car shortly before 1 pm, giving us around 5:45 to complete these two peaks. We got into the car and started driving north, to reach the Shadow Mountain trail head. While relatively close, parts of the drive are on dirt roads with lower speed limits, and it took us about 50 minutes to reach the second trail head and get ready. The goals here were Shadow Mountain and Mount Bryant, both unranked. The distance looked to be about 7 miles each way to get to Mount Bryant, and Fosters book talked about thick forest in the area. 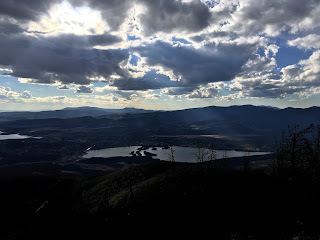 We made great time on the Shadow Mountain trail, which stays low and close to Shadow Mountain Lake for the first mile and a half, and then starts switch backing uphill for 3.3 miles. The trail isn't rocky, and at a moderate grade, and the miles went by quickly. We arrived at the Shadow Mountain Lookout about an hour and forty five minutes after we left the th. Shadow Mountain Lookout and some ominous looking clouds. We felt a few raindrops in the area, but it fortunately never really got going. Looking down into the East Inlet Basin. We took a slightly different route than described in Fosters book, heading east from the high point of the trail to visit Shadow Mountain. She describes thick trees along the way, but we found the forest to be rather open, and simply skirted any troubles that stood in our way. One of no less than five benchmarks in close proximity to the summit of Shadow Mountain. It would be interesting to talk to the person who placed it, if they are still around that is. A permanent fixture that only serves as a memorial to the impermanent nature of our lives. From the summit, we left south east and contemplated dropping in elevation to start up Mount Bryant. A look at the topo convinced us that it was probably best to stay on the easier ridge down to the saddle between Shadow and Bryant; this worked quite well, and the forest stayed pleasantly open. In fact, we were making such good time that it felt like we were still hiking on a trail. 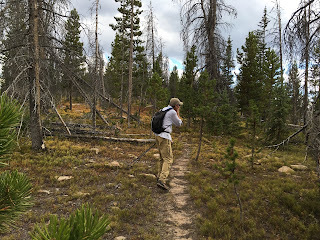 From the saddle, we started to encounter some more rock and thicker patches of forest, but again, were able to move to avoid these if the going looked too tough. Gary leading the way. While this trail didn't go directly to the summit of Mount Bryant, it was certainly a nice surprise. We agreed that it looked a little bit too well put in to be an animal trail, though it obviously doesn't get much use- perhaps it ended up at an old mining claim or something. It would be fun to go back and follow sometime. Once home, I looked over all the historical maps I could find and was not able to locate a trail in this area on any of them, so who knows? We broke from this trail, and after a false summit or two, made it to the top. Pretty awesome! I looked up the person who placed it (some info about him). And, as Foster noted, the Bryant family came out from Oregon in 1981 to climb this peak and commented in the register, "Everyone should climb their own mountain." Truly a beautiful sentiment that echoed through 35 years to reach us on this summit in 2016. I was less than a year old when those words were written. We left the summit, found the trail, and decided to visit the rocky outcrop slightly north west of the true summit. This provided the views we'd been missing. Looking back to Mount Bryant. We got back to the trail and decided to run down. Unfortunately for me, it's been awhile since I've ran, and I pooped out before we got back to the trail head. We got situated at the car and started the long drive back, parting ways in Lyons. In the end, the day turned out to be a pretty fun one, despite my initial annoyance at having to go back for something I'd already visited before. In some ways, I find these lower, treed in summits more rewarding than the higher ones. How cool is it to find a register placed two years after your parents got married, long before the concept of you even existed. How humbling to visit a summit that has been in situ for millenia, and will be for long after I am gone. But through the threads of time, and a shared passion, we can connect, as I connected with Frede Jensen on this day. One day we will cease to exist, but our passion will never die. Twin Peaks East, 11957 feet: 4.1 miles, 3657 foot gain. Third class. Strenuous. Twin Peaks West, 11940 feet: 4.2 miles, 3640 foot gain. Second class. Strenuous. This leg of the hike covered 9.05 miles with 4006 feet of elevation gain in up to third class terrain. Strenuous. Shadow Mountain Lookout, 9923 feet: 4.75 miles, 1503 foot gain. Moderate. Shadow Mountain, 10155 feet: 5.45 miles, 1735 foot gain. Second class. Moderate. Mount Bryant, 11034 feet: 7.1 miles, 2614 foot gain. Second class. Moderate+. This leg of the hike covered 13.76 miles with 3435 feet of elevation gain in up to second class terrain. Strenuous-. I always enjoy reading your posts. This one was especially touching when reading your ending thoughts.